The religious figures of Jesus’ day had it all figured out. They knew the religious system and the religious buzzwords inside and out. They could spout bits of Scripture to prove everything he said was wrong. They called him a “heretic” and worse: one who speaks evil against God. Jesus’ preaching challenged the doctrines of religious leaders, plainly telling them they were wrong, and that they needed to rethink their beliefs and practices. It was no longer just enough to SEEM to be doing God’s will, one must actually DO it, he said. It was not enough to SEEM to be pious, praying publicly with long prayers and fancy words. One must actually BE pious, and do much of it in private. Intentions mattered as much as outward appearances, said Jesus. And the motives of the heart, which give birth to actions, are important to control (and CAN be controlled) and turned towards Righteousness, so that our actions will also be Righteous. But it is never easy to challenge religious ideas - especially long-cherished ones. It can hurt feelings and brings great anger. 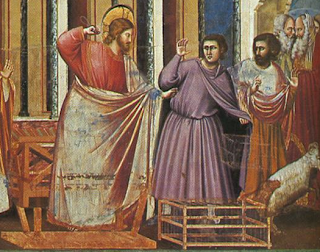 Yet, Jesus was often blunt, and he knew that he would be met with great anger and even death. And so he was. And in three days, God took Jesus back. But soon after his death and return to God, others came – as Jesus had predicted – with a different Message, one that was easier, less Godly, and less powerful and challenging to authority. They called on people to believe special things about his death, but to not worry too much about his teachings and life. They told people that Jesus wasn’t REALLY calling for us to perform Righteous Works, because we are not capable of them. God, they claimed, at his own good pleasure, doles out the strength we need in order to do the Good Works, then rewards us for doing what He did through us. And they elevated Jesus to equality with God, so that he could be admired, and worshiped, but not imitated. Thus, they put Jesus out of reach, out of touch, and out of our minds as a perfect example to follow, and the Dark Ages and “reformation” which followed did nothing to bring the original Jesus back. Today, the story that was once powerful and universal is powerful in numbers and wealth, but is almost universally arrogant and prideful. Shockingly, Christendom today promotes a “Wide Gate” of easily-obtainable eternal salvation at the drop of a check, after spouting an unbiblical, simple prayer. Much of Christendom – particularly PROTESTANT Christendom – teaches that we may, without repentance or Good Works, and with only a few magic words, steal from God the salvation promised through His messenger, even though Jesus told us that this was available to us ONLY if we repented and worked Righteousness. A movement - a "Reformation" - that started off with such promise, but gained earthly power and dominance at the cost of its soul, is in need of a fuller, more complete Reformation. A message that originally was a clear, simple call to greatness through perfect Love and a call to serve God and other people through complete self-sacrifice stands in desperate need of renewal. What is easy to purchase with a quick prayer and a promise of wealth must be rejected and confronted as false and contrary to Jesus’ express teachings. What is incomprehensible and man-made must be stripped off like a layer of suffocating paint, so the original Truths of Jesus may shine through and breathe again. What became large and lethargic must become again humble and holy, less demeaning and more dynamic in its evaluation of what we, as God’s creatures are both called to do and capable of doing for others and our Creator, God. Today, as we embark once again on the Way Jesus preached, we must also dare to boldly question today's religious leaders' long-held, man-made beliefs, as well as some even less attractive alternatives which call us to look inward and serve only ourselves. We must do the hard work of discerning God’s will for our lives and re-learning Jesus’ true message. In other words: we must keep Reforming! Like the religious leaders of Jesus’ day, today’s religious leaders are not going to be very happy about being challenged, either. But we owe it to God and the one whom God sent to us – the man, Jesus, our Master – to become merely Jesus Followers and servants of God once again. In his ministry, Jesus challenged all those around him. He challenged the religious authorities who led a faith of empty ritual and mindless words to instead embrace an authentic faith of love and devotion. He challenged the wealthy to give up the idol of money. Jesus’ teachings, when seen as the core of his ministry, challenge us today, as well. In fact, the Good News that Jesus preached is nothing but a challenge to our comfortable lives. It challenges the lazy faith which is based on mere words and devoid of love of others or Good Works on their behalf. It’s a challenge to us all, individually, to begin to reach our full potential, by living the way God wishes us to live – lives of selfless service and love. The words, life, teachings and death of our Master, Jesus, challenge us to do, to act, to follow, to serve, to be better, to do more, to try harder, to be humble, yet Righteousness, to serve God not money, to lose ourselves, but gain eternity. We are called by Jesus to seek and do Good, in order to advance God’s Kingdom on this earth. Jesus lived, taught and died as a pure moral example for us, so that we should follow him and be made perfect in Righteousness. We do this with God’s help and a reliance on God’s holy Spirit. And we are required, on this journey of Faith, to always seek God's forgiveness for our faults and failures as we strive towards the perfect expression of Righteousness God's Anointed Son, Jesus, has modeled for us. We are called to show by our ACTS that we are heeding his call, and are taking up his challenge – not in a prideful way, but in a way that is pleasing to God. Jesus clearly calls us to an active Faith - a Faith that Works. His teachings, his Gospel, is a challenge worth accepting and worth LIVING, because it leads to directly to a spiritually complete life and, God willing, to eternal life with our Creator. Jesus calls us to love God with all our heart, soul, mind and strength (Mark 12:30.) That’s complete and total love, not just lip service or weak emotionalism. Jesus calls us to deny ourselves take up our cross and follow him. (Mark 8:34; Luke 9:23.) We are to be “other-centered,” not focused on Self. 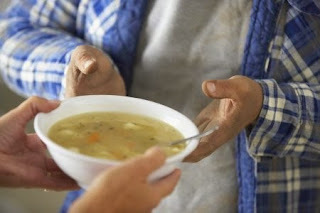 And Jesus calls on us to “go the second mile” (Matthew 5:38–42) which is not a challenge to be lukewarm or partially committed to serving others. When we encounter what is being claimed to be “the Gospel,” if it fails to challenge us to pursue Good Works, we know that it's a false and easy Faith we've encountered – a wide gate, rather than the Gospel preached from the very mouth of Jesus. That Jesus challenges us with incredibly high goals is undeniable. That he believed we could achieve them is proven by his words. And because Jesus, a human being like us, has done this, we are assured that we, too, may accomplish God’s will for our lives. So let’s take up the Good News of Jesus’ challenge in our lives and let it shine within us for all to see! There is a wonderful simplicity, plainness, directness and grandeur in Jesus’ instructions, and in the mode of communicating them. From the first recorded instance of his teaching to the last, he displays a knowledge of human character, and an adaptation of the lessons given, to the wants of men, in speaking of God, of His worship, of His purposes, there is no hesitancy, no embarrassment. Jesus speaks about these things as topics perfectly familiar to his mind. The same is true of the great principles of duty laid down by him. Of that eternal future, which, to every other teacher has been a dark and mysterious theme, he speaks in Words easy to be understood, yet of mighty power to reach and awaken all the powers of the soul. It would seem as if he indeed had been in the bosom of the Father, and was commissioned to bring to men His counsels; as if he needed no other testimony than the very lessons which he taught, to the truth of his own declaration, "My doctrine is not mine, but his that sent me." A God is revealed by Jesus whom the understanding may reverence, and feel itself exalted by its communion with Him - a God whom the heart may love, and, as its affections are fixed upon him, may find in its own emotions an earnest of that fullness of joy, which is the hope of the gospel. Man is to worship God by making his heart the altar of incense. His mind, his soul, his all, is to be consecrated to God; and his worship is to be a rational and affectionate conversation with Him. We have also in the Gospel the great principles which are to guide men in all their personal habits, and their social relations. And the simplicity of his teachings, which make them so easy to be understood and applied, displays the consummate wisdom of the teacher. His mode of teaching is no less peculiar and striking than the lessons taught. It is so simple, that all can understand them. In these teachings, God is everywhere, religious principle is combined with everything, man’s responsibility and destiny are kept perpetually in view. There are no formal dissertations, weighty truths or glowing pictures. It would seem as if it was the perpetual object of the Master to pour into the human mind the full light of heaven, to render visible the miseries to which guilt must doom the soul, and the glories which await, if we are pure and holy. There is also a peculiar individuality in the instructions of Jesus. He addressed masses of people, but they stood before him, not as masses, but as individuals. They were made to feel this. They were made to clearly understand that their happiness was dependent not upon their descent, their privileges or their connections; but upon their personal characters. Under what circumstances did Jesus commence his glorious career? At a period marked by moral degradation, among a people attached to the mere ceremonials of religion, narrow-minded and bigoted, proud of their national distinction, and uniting with their boastful show of religious observances the utmost corruption of manners. This people had expected, indeed, a reformer; but what had they anticipated in him? Certainly not one who would rebuke their sins, cast away their moral and religious sentiments, and establish the empire of righteousness, but one who would flatter their pride, lead them into battle, give splendor to their monarchy, and enable them to tread their oppressors in the dust. This is the nation in which Jesus grew up. Yet their bigotry, formality, and prejudice did not affect him in the least degree. He came forward with the most comprehensive, enlightened, generous teachings, suited to all times and to all people. The teachings of Jesus, where they have been faithfully studied and applied, have led the human mind in its upward course, and brought into the heart a more thorough goodness. They have been found adapted to the condition and needs of the most cultivated minds; and, let humanity go on for a hundred centuries improving, his teachings will be still be leading us, still pioneering our onward progress. This is a wonderful fact, considering the circumstances under which our religion was promulgated, and attests with power the divine authority of its founder, and the manner in which he brought to us his great and God-anointed mission. That God pardons us, and is merciful, isn't something new. In fact, it was known long before the time of Jesus. If the idea that God forgives the sins of those who repent was fully known to the Jewish people before the time of Jesus, how, then, can we say Jesus saves those who sin? When Jesus called people to the hope of eternal life, he said they must change their evil ways, putting behind them all evil things they were doing before. This was to make them qualified for the eternal happiness they would have with God, because God is the opposite of evil. Jesus’ teaching was practical – telling us what we should DO to attain eternal life, not just what to BELIEVE about it. This was how they were to be blessed or saved by Jesus: by listening to the preaching of his Apostles, who spoke in his name, and who urged them to stop sinning. The Judeans expected great earthly riches from their Messiah. Instead, Jesus and his Apostles said they were to gain great moral blessings by knowing the Gospel, and by becoming holy and good through their actions. THIS was what would qualify them for eternal life with God. 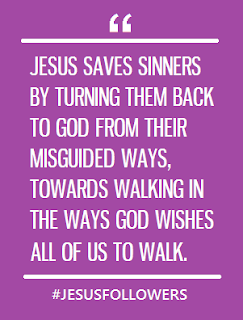 It is THIS way that Jesus saves sinners: by calling them to turn back to God from their misguided ways, towards walking in the holy ways God wishes all of us to walk. If we learn from Jesus, whose words and example are set before us by his life and teachings, we can begin to work towards virtue and holiness and doing God’s will above self-centered actions and immoral actions. Then, if strive to keep on the narrow road, eternal life may be ours, God willing. But many aren’t satisfied with this plain and simple way of salvation, which is spelled out by Jesus and the Apostles, who obeyed his teachings. 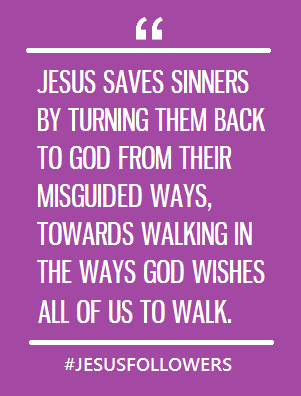 Instead, they want to be saved, but continue to sin. Many want eternal life after death, but wish to live opposed to God while they’re still alive. So, by twisting a few verses, they fail to see the role of Jesus as a teacher of righteousness who calls us to obey and do good works. They imagine it was his goodness ALONE that allows God to forgive His creatures, and that if we only believe this, we can gain an “instant salvation" that gives us a loophole that lets us continue to sin, but still get a reward from God. They want to pretend that Jesus is the only one who needs to obey God, but not us! They want to “trust” in another’s righteousness, but continue to do evil things! Didn’t Ezekiel warn us of this very mistake? This is wrong because our heavenly Father has always been merciful towards his children, and is ready with open arms to receive them to his mercy simply when they repent, without the actions of any other person on their behalf. The sufferings of our Master, Jesus, he did by obeying God, and this is a powerful example for us, convincing us to change our attitudes and reconcile us to God – but his suffering did not change God’s mind about us, since God was, and remains, always ready to show us kindness and mercy. It’s foolish to passively expect God to grant us salvation; and even more foolish to believe we can demand it from a position of laziness – refusing to repent and change our lives, as God requires us to do. We have to make ourselves ready and qualified for salvation by adopting a holy attitude and actively building virtuous habits. And these changes can’t happen within us unless we actively want them to happen. It’s this constant striving for moral perfection, working in goodness, imitating our Master and Example, Jesus, that Jesus calls us to do.